Introducing Calibrator™ - A Marketing Dashboard Solution for Law Firms - Calibrate Legal, Inc. : Calibrate Legal, Inc. Whenever we talk to clients about marketing measurement, the topic of dashboards is never far from the agenda. Clients tell us that gathering and analyzing metrics from various sources (such as CRM systems, e-marketing platforms, web analytics) is a tedious chore that they would love to automate. That’s why we’ve developed Calibrator™, a marketing dashboard solution tailored for law firms. 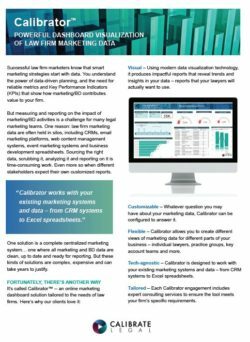 Calibrator™ is designed to work with your existing marketing technology to produce visual, interactive reports that highlight insights and trends in your data. Highly configurable, it lets you create marketing dashboards customized for any part of your business — whether it’s individual lawyers, practice groups, key clients or the entire firm. To get a preview of Calibrator™, check out our online sampler. You’ll see prototype dashboards created to help measure contact health, email marketing impact, key account marketing, proposal success and more. To learn more about the benefits of Calibrator™ for your firm, download our fact sheet here. We’re currently offering demos of Calibrator™ to interested law firms. If you’d like to know more about how our solution could work for your firm, click here to request a demo.